The term "ionization energy" is a reference to the quantity of energy necessary to expel an electron from an atom or molecule. As electrons are removed, it becomes more difficult to remove another, as the charge of the atom has changed and the electron is more attracted to stay with the atom. As such, different ionizations of energy can be required under different circumstances and it is important to know how to properly calculate the quantity of energy required. 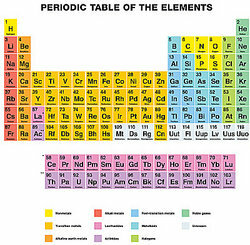 Ionization energy increases moving from left to right on the periodic table, a table of the elements. The energy decreases moving from top to bottom on the periodic table. Ionization of energy must be calculated for each ion on the periodic table. As such, to understand ionization of energy, it is helpful to understand the equations that are used in calculating the quantity of energy necessary to expel electrons. The amount of energy necessary changes each time an electron is let go, since it becomes more difficult to remove electrons after one or more has already been removed from the atom or molecule. Therefore, the equation changes. Units used to measure ionization are not always the same. Chemists refer to one mole (mol) of a substance when reporting ionization energy. This unit is kJ/mol or kcal/mol. The unit electron volt (eV) is used by physicists. In eV units, the chart shows the first ionization energy for all elements. To convert to the same measurement as above, multiply by 96.4689. It is important for those in various scientific fields, including chemistry and physics, to understand the concept of ionization energy and to understand how to use the equations to calculate the ionization energy for each element. The different equations for different ionizations, therefore, as well as the information on the different ionizations of energy for each element, are very helpful for those who are hoping to better understand how ionization of energy works. "Examples of Ionization Energy." YourDictionary, n.d. Web. 23 April 2019. <https://examples.yourdictionary.com/examples-of-ionization-energy.html>.